I became a Wyndham Rewards Member, in order to be able to purchase some points through the Daily Getaways with American Express promotion, of which I blogged about here. Unfortunately, I wasn't able to purchase those points. But since I "liked" them, I was able to see their sweepstakes on my Facebook home page. That is how I came about this information. Wyndham Rewards is the rewards program of Wyndham Hotels & Resorts. 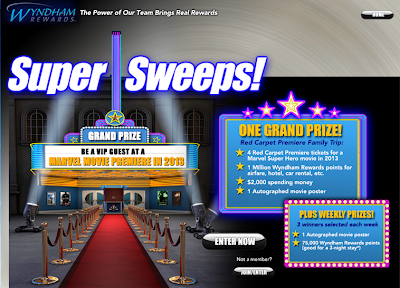 They have a sweepstakes running now through May 15th, whereby you could gain many valuable Wyndham points and prizes. You can only enter once. The grand prize winner will be chosen at random on May 16th. To enter you must be a Wyndham Rewards Member, if you are not a member, you may sign up here. In addition there will be a weekly drawing on Wednesdays, and 3 winners will be chosen at random. There are many things you can do with your Wyndham Rewards points, besides using them for hotel stays. Below, you will find other options for the use of your points. Hotel Rewards Choose from over 6,500 Worldwide locations, with no blackout dates within the US and Canada. Gift Cards starting at 2,200 points for restaurants, merchandise, charities & entertainment, including Gift Cards for Busch Gardens & SeaWorld. Airline Miles: For every 2.5 Wyndham points you get 1 airline mile. See below. Deals & Discounts From time to time they have special promotions.